"First it was a rumor, then it was too late. When the House of the People/ Ceausescu Palace was built (1984-today) it mutilated not only the city of Bucharest, but an entire country. When Parliament moved into the Ceausescu Palace, it mutilated the idea of a Democratic society. A symbol of the past has become a symbol of the future. It is clear that the transition period will last longer and will be much more difficult than expected. When the National Museum of Contemporary Art was established in 2004, the parliamentary Palace/ Ceausescu Palace mutilated not only the local visual art scene, but the Romanian culture as a whole. This project aims to explore some of the consequences. The Center for Art Analysis acts as a detective researching the case, collecting proof and calling for witnesses." The lines above are part of the curatorial statement of Lia & Dan Perjovschi's project presented in the On Difference #1. Local Contexts � Hybrid Spaces exhibition - initiated by Iris Dressler and Hans D. Christ - taking place at the W�rttembergischer Kunstverein Stuttgart from May 21 to July 31, 2005. As part of their project for this exhibition Lia & Dan Perjovschi have published a new issue of the Center for Art Analysis magazine. 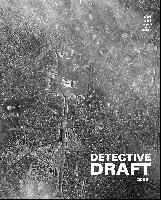 DETECTIVE DRAFT 2005 issue investigates the context in which the Museum of Contemporary Art in Bucharest was established, and extracts files of the debates still ongoing on the location of this museum in the faimous House of the People building, also hosting the Romanian Lower House of the Parliament. Consult the full text of the magazine by opening the 7 pdf files below. � Center for Art Analysis. The pictures featured in the gallery are extracted from the DETECTIVE DRAFT 2005. The Center for Art Analysis (CAA) is a non-institutionalised contemporary art archive and platform of debate initiated by performance artist Lia Perjovschi. Under different names CAA has been active since 1985. It is a space for contemporary art and critical attitude. A database (international) focusing on art theory, cultural studies, and critical theory; comprehensive collection of slides, video tapes, CD, catalogues, books, reviews, documentation of international art and cultural events. An exercise for dialogue, communication, empowerment, natural relation on issues reflecting the current debate in the art field and new cultural theories, about the social and political relevance of art, the autonomy and context of art. From one to one dialogue to group discussions, lectures, presentation, workshops, exhibitions.